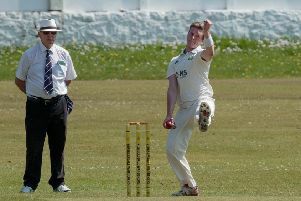 Salesbury moved into the promotion places in Section B of the CBS Office Supplies Ribblesdale League on Saturday. The Red Caps beat league newcomers Feniscowles and Pleasington by 20 runs to leapfrog Padiham, who lost to leaders Barnoldswickby five wickets. Feniscowles won the toss and elected to field at the War Memorial Ground. Salesbury got off to a solid start as Chris Riley and Neil Hornbuckle shared 56 for the first wicket, and when that partnership was broken, with Chris Riley bowled by Khuram Mahmood for 22. Hornbuckle and Liam Parkinson built on that start, taking the score to 122, when Parkinson fell to Nizam Vaid for 33. Four wickets fell for the addition of 29 runs, with Hornbuckle fourth man out for 61, which included seven fours. Andrew Mercer helped push the score out with an entertaining 50-ball unbeaten 60, with five fours and a six, as Salesbury closed on 220-9. Feniscowles made a good fist of chasing the target, before their final wicket fell 20 runs short in the final over. Jake Errey was out for five at 14, caught behind by Nick Green off Sam Bristol, but Jack Ellison (19) and Jacques Snyman (57) put on 59 for the second wicket. Sam Bristol then caught Ellison (19) off Josh Bristol, but Snyman and Amedeo D’Ippolito took the score to 126. Snyman was run out for 57, and Mercer (2-73) and Hornbuckle (3-44) held up Feniscowles, although Lee Cunningham hit a 23-ball 29. Sam Bristol (3-43) returned to mop up the tail. Salesbury host Baxenden on Saturday.